Prep Bok Choy: separate white stalks and greens; trim stalks of the thick ends, the rest sliced into 1/4″ pieces; greens cut to 1/4 to 1/2″ pieces. In a large Dutch oven or large pot, heat EVOO over medium high heat until shimmering. 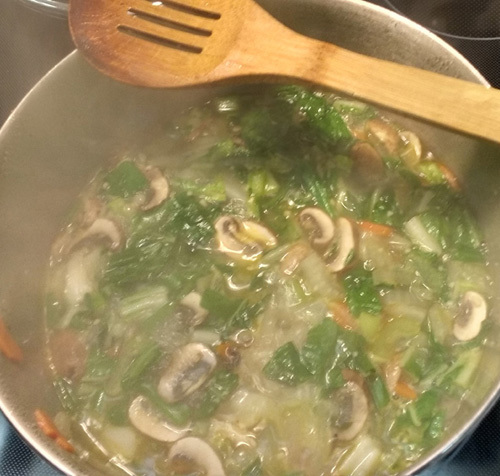 Add Bok Choy stalks, Onion, Carrots, Celery: cook, stirring frequently, until tender, about 7-10 minutes. Add Garlic, Ginger, and Tumeric, and cook until fragrant, about 1 minute. Add Chicken broth (or Vegetable broth if Vegan); bring to boil. Turn heat down to medium high; add Mushrooms and Bok Choy leaves; cook, stirring frequently, until Mushrooms are tender and Bok Choy leaves are wilted. Add Green Onion and serve. Add Chicken at Step 6, and heat through before adding Mushrooms and Bok Choy green leaves. If soup is too thick, thin with more broth or water.